Cortisone is a hormone released by the adrenal gland in response to stress. It is a potent anti-inflammatory agent. Synthetically produced cortisone is more potent and longer acting than natural cortisone and is used for diagnosis as well as treatment of a variety of musculoskeletal conditions such as tendinopathy, bursitis and arthritis. Artificial preparations containing cortisone are injected directly into the affected joint to relieve pain and reduce inflammation. 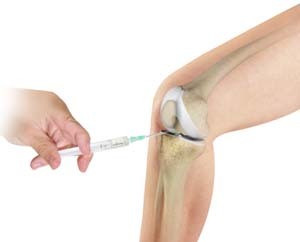 Cortisone injections produce a significant reduction in pain and inflammation in a majority of cases. The duration and degree of the beneficial effect can vary from patient to patient. It takes about 2 to 3 days for the cortisone injection to produce any effect. In some individuals these injections may not produce any effect. The frequency of cortisone injections is limited by the risk of tendon rupture and damage to cartilage. Infection at the injection site: It is a rare but serious complication and may be associated with fever along with pain and swelling at the injection site. Antibiotics may be prescribed for the management of infection. Transient elevation in blood sugar in patients with insulin dependent diabetes: This may last for up to 10 days. Diabetics should consult their doctor before the procedure for temporary modification of their medication. Redness and flushing of the face: This may occur on the second or third day of the procedure and may last for about 7 days. Antihistamines can be used if the redness fails to resolve. Prolonged high dose steroid therapy may be associated with avascular necrosis of the head of the femur or humerus. In case of any adverse reaction contact Dr. Patel immediately.